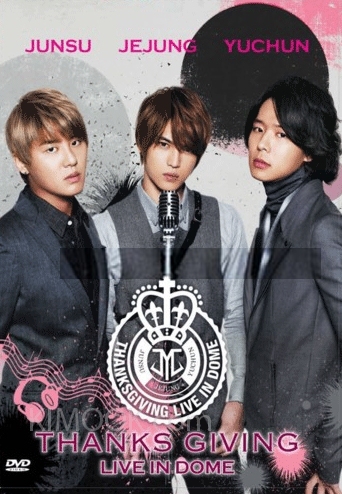 Starting anew amid the drama, Dong Bang Shin Ki's Jun Su, Jae Joong, and Yoo Chun formed a unit and held the Thanksgiving Live in Dome tour in Japan in June 2010. The trio staged the concerts especially to thank the fans who kept the faith and supported them through the hard times, and the response was overwhelming. Concert organizers received over one million applications during the presale ticket lottery, and 200,000 lucky fans eventually attended the trio's four concerts at the Kyocera Dome and Tokyo Dome. Feelings ran high for both the members and the audience as Jun Su, Jae Joong, and Yoo Chun reaffirmed their commitment to music and to the fans. They performed solo and cover songs and also introduced the highly anticipated new songs Itsudatte Kimi ni, Get Ready, Long Way, and W, demonstrating that no matter how much things seem to have changed, their beautiful voices stay the same. The Thanksgiving Live in Dome DVD release records the final concert of the tour.